Facebook Ads are super powerful, and as a result are an incredibly popular way to drive traffic. Seems like a no-brainer to most people! Sometimes though, just getting started can be intimidating on how to find the right audience to show your ads to. A great shortcut if you have any kind of email list built at all? Lookalike audiences are groups of people who share similar attributes to an existing list (or page, pixel etc) you already have access to. Lookalike audiences help you find similar people on Facebook that share as many traits as possible with an existing list you already have. Know who your best customers are? You can upload that to Facebook, which is matches the email with their Facebook profile and figures out what attributes those customers have in common. Then, using the vast amount of data that Facebook has (and with the help of their data partners), they go and find other very similar people for you to advertise to. This unlocks the massive power of the data available to Facebook. Getting started is pretty easy, since Facebook does all the heavy lifting for you. 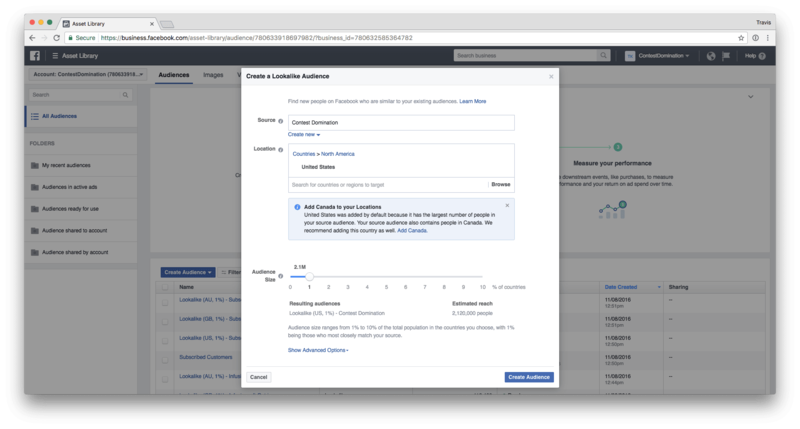 We like to use the Facebook Business Manager because we have multiple properties, but you can easily go to your personal ad manager if you’re just getting started. You can either upload a CSV of your email list (now supporting lifetime values as well), or you can select from available fan pages or conversion pixels. If you’ve tightly curated your fan page, that should be an easy place to start. However I HIGHLY recommend you either use a conversion pixel from your core product or an email list of those customers. The goal here is to have Facebook help you find more CUSTOMERS, not just more people “interested in your niche” in general. After uploading or selecting your source, it will take at least a few minutes for Facebook to match your new Lookalike audience. The larger the data pool, the longer it will likely take. It may take hours, or may be super fast. No real way to know 100% how long this part is going to take, but you’ll get a flag when it’s done and ready to go. After it’s processed your new lookalike audience it will show up with a naming scheme that makes it obvious which is which. Now that you have this brand new audience of people similar to your (hopefully) best customers, it’s time to put it to use. When you create your ads, instead of going through the normal motions of all the interest targeting, try just targeting the lookalike audience by itself. After you see some of your initial results, it’s good to layer on top some more interest and/or age filters in different ad sets. And that’s pretty much it! I’d argue this is the most powerful tool in Facebook Ads and it’s also one of the easiest to use if you have an existing audience at all. PS: Looking for more information about Facebook Ads, specifically for contests? Check out these other related posts: Facebook Retageting as well as our guide to Affiliates & Advanced Tracking.